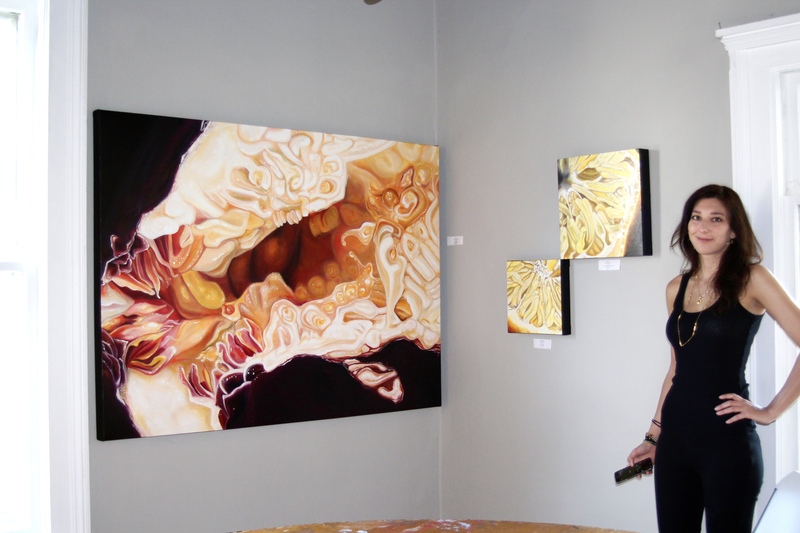 Angela Faustina and her Black Mission Fig VI, Lemon I, and Lemon II oil paintings at the From the Garden art exhibition, 2016. My sticky sweet oil paintings transform glistening fruit into its own vibrant world. Capturing juicy pulp at the peak of ripeness highlights the beauty and vibrancy of life. My paintings are intimate, surprising, enigmatic, and bold as hell. My artwork takes close-ups to the extreme. The vibrant imagery is easily identified as organic but from there the imagination can take over. I constantly change the physical scale of my paintings and species of fruit to heighten the sense of mystery. I want to blur the boundaries between abstraction and representation, the microcosmic and macrocosmic, attraction and repulsion, and whimsy and the scientific. Capturing glistening fruit in oil paint pays homage to traditional still life painting while distorting the genre. I exploit the beautiful, prosperous, fertile, tempestuous, and sensual symbolism and connotations fruit carries by preserving it at the peak of ripeness. Unlike memento-mori genre paintings that serve as a reminder of death, I shield fruit from rot and decay as a reminder to live. The fruits delicate organic structure, luscious colors, and contrasting juicy and pulpy textures are eternalized in my work. The black backgrounds and painting panel sides are a nod to the backgrounds popularized at the height of still life painting in the 17th Century. The absolute-ness of my black also helps remove all context of time and place, lending a sense of otherworldliness to the imagery. The displacement can feel alien but the common subject matter connects world cultures. Regardless of race, religion, or time, fruit is a favorite food that brings people together. The interconnectedness of organic life is another theme I explore while painting. Interiors of fruit echo the forms and textures of human viscera; cropped citrus pulp and gooey pomegranate and fig seeds can resemble intestinal tract, blood cells, and neurons to the unfamiliar. The bright, often tropical hues of my paintings and the variety of fruit that I paint evokes my personal childhood in South Florida, a multicultural mecca for the beautiful, vibrant, and weird. The audience’s unfamiliarity with the fruit imagery can elicit contemporary issues about American food culture and the prevalence of processed food. Follow me on Facebook and Instagram for a peak into my life as an artist. Be sure to subscribe to my newsletter, too!